P.R. ALERT! 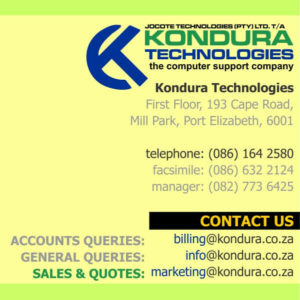 All customers of Kondura Technologies CC, please be advised that we had attempts by individuals on a forum to associate us with a completely unrelated, different company that used to trade in Port Elizabeth called “Kondura Maintenance Services” aka “K.M.S.” and appears to no longer be in existence – a company that is/was involved with CCTV installations for casinos. This particular individual alleged that “we” were this company and have gone into liquidation and allegedly left bad debt for creditors in the Port Elizabeth area. This is obviously a case of mistaken identity. We cannot, at this time, confirm these allegations against this other company which we assume is a company trading as KMS. We are not sure, but we wish to confirm that our credit record is spotless. Kondura Technologies CC and its members are not and never have been associated with K.M.S in business in any form and the only association is having a similar name. We believe the company, KMS, used to be a supplier and installer of CCTV equipment for casinos in the Eastern Cape. We had no association with them other than a legal dispute over our name rights. It must be noted that only a company with a license to install this equipment approved by the gambling board is permitted to install CCTV in casinos. Kondura Technologies CC does not and has never applied for or aquired this license. Initially, we had a brief legal dispute with KMS that was handled amicably by a managing member of KMS with our company manager. They agreed to trade as KMS and and exclusively deal with CCTV’s for casinos and not attempt to enter our established markets. KMS is/was a completely different, unrelated company with (we believe) its head office still in Johannesburg. Kondura Technologies CC has been in business for almost two decades and as our suppliers will confirm, have never had a bad debt or judgment against us or our members. More references will gladly be provided on request. Although the name “Kondura” was a completely an original, independantly inspired and generated name independant of outside sources, formulated by the very young (at the time) managing member of Kondura Technologies, it was later discovered to not be an original word – many years later with the power of the internet, it was discovered that the word “Kondura” is also the name of a very old Indian film which apparently refers to a young Indian man’s “awakening” in life. This entry was posted on 11th August 2013 at 07:50 and is filed under BLOG Posts. You can follow any responses to this entry through the RSS 2.0 feed.